During this year’s municipal election, far more is at stake than just the mayoralty. Toronto has forty-four wards, each with its own council seat up for grabs. To demystify the most contested of those races, Torontoist is presenting a series of profiles of the key candidates. Karen Sun, Mike Layton, and Sean McCormick. All images courtesy of the respective candidates. Ward 19 is bounded by Dupont Street in the north, and Exhibition Place in the south. Its east and west boundaries are Bathurst Street and Dovercourt Road, respectively―except for a narrow section at the top where the eastern boundary is Christie Street. Ward 19 encompasses some of the City’s best-loved parks, including Christie Pits and Trinity Bellwoods. It includes the popular (and controversial) Ossington Avenue strip, as well as the burgeoning condo community in Liberty Village. The area’s rapidly changing character has become a matter of contention in this year’s election, and nine candidates are running for Ward 19’s council seat, soon to be vacated by Joe Pantalone. 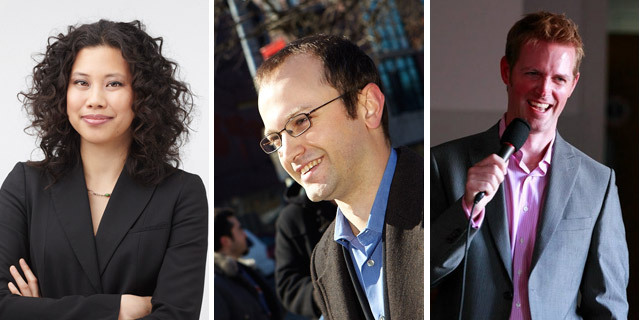 Here, we focus on three of the most prominent—Karen Sun, Mike Layton, and Sean McCormick. Do you live in Ward 19? See our Ward 19 page for an interactive ward map, photos, and more. Karen Sun brings local environmental credibility to her council bid, having worked for the City of Toronto’s Urban Forestry Services and also for its Water and Wastewater Division. Later, she became executive director of the Chinese Canadian National Council Toronto Chapter. Currently, she serves on the boards of several extra-governmental community organizations, including Heritage Toronto. Sun has reservations about Liberty Village condo development, though she doesn’t exactly disapprove. Sun said that, as councillor, she would work to negotiate with developers, in consultation with Ward 19 community members. 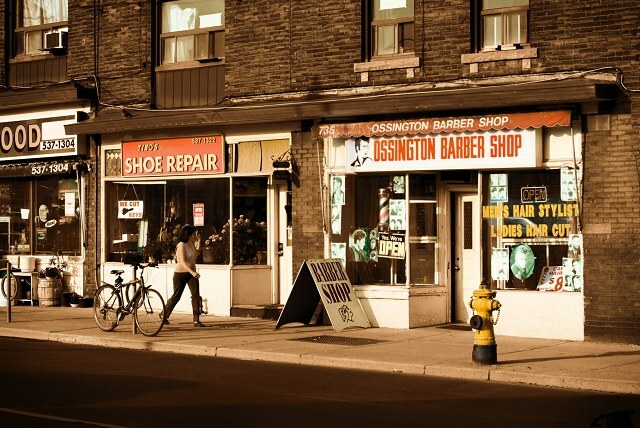 Sun believes that Ossington’s development was happening too quickly, but said that the decision to impose the ban was made without adequate community consultation. There were, in fact, exactly two community consultations held by the City. Both took place after the interim ban had gone into effect. The first was attended by roughly 175 people, while the second only attracted seventy to eighty, according to a report by City staff. Sun would try to allay taxpayer anger by increasing transparency in the City budget process. Sun has been involved with the Toronto Open Budget Initiative, a group that advocates for community involvement in the municipal budget process. “I would prioritize bike lanes on roads that see the most bike accidents. And here it’s Queen, College, and Bloor,” Sun said. Sun was executive director of the Chinese Canadian National Council Toronto Chapter when Ford committed his now-infamous “orientals” gaffe. 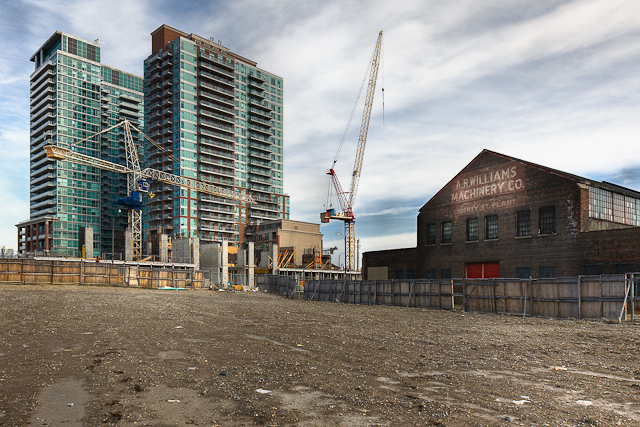 Condo construction in Liberty Village is of concern in Ward 19. Photo by Stephen Sokolov, from the Torontoist Flickr pool. Mike Layton has a few things going for him, his environmental policy experience being one. Most recently he worked as an outreach officer for Environmental Defence, an advocacy group that engages with a range of local and national environmental issues. He has also been involved with other environmental organizations. It doesn’t hurt—at least for name-recognition purposes—that he’s a scion of the federal NDP: Jack Layton is his father and Olivia Chow his stepmother. On the patio of a nearby coffee shop, we mention that the afternoon’s stiff cross-breeze might cause problems for the mic on our voice recorder. Layton removes his suit jacket and drapes it across the railing as a makeshift windscreen, and perhaps a dozen pens and pencils rain from the jacket’s pockets onto the sidewalk, about ten feet below. Layton runs down a flight of stairs and gathers them all, then jogs back, sits down, and resumes sipping his iced tea, seemingly unperturbed. “We’ve got to help them do that by investing in the services that they need to have a good life down there.” These, he said, would include green spaces, community centres, and more reliable transit. Layton expressed qualified approval for the ban, provided that the permanent regulations that may ultimately replace it don’t prevent responsible businesses from opening on the Ossington strip. He’s discussed, with bar owners, the possibility of changing licensing laws in order to distinguish between bars and restaurants. He acknowledged that doing this would require provincial co-operation. Layton is in favour of constructing a new downtown relief subway line, to augment the existing downtown lines, but he’d look beyond the City of Toronto to fund it. He’s against selling City assets in order to pay for transit, but would support efforts to lobby higher levels of government for subsidies. “I don’t think there’s a spending problem as much as there’s an efficiency problem,” offers Layton, who thinks the City does a fair job of providing value for money given its continual lack of federal and provincial investment. Layton would pursue the City’s planned bikeway network. “We’ve got to keep plugging away at it,” he said. Layton would support electrification. “Just a little more investment would get this thing done right,” he said. “For years, I’ve been involved in co-ordinating coalitions, sometimes with very, very different viewpoints,” said Layton. He acknowledged that he and Ford would frequently be in disagreement. Rapid change on Ossington Avenue has become an election issue in Ward 19. Photo by Metrix X, from the Torontoist Flickr Pool. Sean McCormick was in sports broadcasting for nearly fifteen years (most recently he was an anchor on Rogers Sportsnet), which gives his campaign a certain amount of built-in visibility. He left his job, he said, in order to focus on his council run. McCormick has little direct political experience, but points to his community involvement as evidence of his suitability for the job of city councillor. In 2008, he founded the Queen West Musicfest, a music festival featuring local indie talent, which takes place each summer in Trinity Bellwoods Park. As a former on-camera personality, he’s handsome, well spoken, and always seemingly in total possession of himself. Before sitting us down in a Starbucks near his campaign office (a former martial arts dojo on College Street), he took a moment to chat up the barista about the election. McCormick is generally in support of more and denser development, though he concedes that developers require a certain amount of oversight. His one particular concern is the yet-to-be-built Liberty Village pedestrian bridge. The bridge would enable easier access to Liberty Village by spanning the railroad tracks that run across the neighbourhood’s northern edge. Currently, a majority of residents use Strachan Avenue to cross the rails, which can be inconvenient for some. The bridge has already received preliminary approval, and is in the midst of an environmental assessment (after which it will need final approval by City Council), but McCormick said that, as councillor, he’d attempt to expedite the process. McCormick is in favour of expanding the City’s subway network. The eight-billion dollars McCormick was referring to was the original sum pledged by the province towards construction of the lines. Earlier this year, that sum was cut in half, to roughly four-billion dollars. The province’s money is, as McCormick said, earmarked only for building the proposed new lines, and not operating them. TTC spokesman Brad Ross confirmed that operating costs for the lines are still unknown. Those costs “are still being worked out based on the level of service (how many LRTs at what time of day, etc.) together with projected ridership,” he told us in an email. McCormick’s preferred transit solution is subway expansion, which he acknowledges would also require significant investment. “I’m not going to say I support this one way or the other, but I like the way he’s thinking on this, because he’s thinking in a fiscally responsible way,” said McCormick. “I’m referring to Rocco [Rossi’s] plan on subways,” which involves selling City-owned Toronto Hydro to raise the capital necessary to pay for more subway lines. McCormick is also intrigued by the idea of contracting with private companies to operate new subway lines. McCormick would cut both spending and taxes. McCormick is in favour of eliminating both the Land Transfer Tax and the Vehicle Registration Tax. He strongly opposes the City’s practice of offering sole-sourced contracts. McCormick would support painting new bike lanes only on non-arterial roads. McCormick believes electrification would be too much of a burden on the taxpayer, for the time being. McCormick’s policy goals are not in significant conflict with those of Rob Ford. Get more municipal election coverage from Torontoist here.